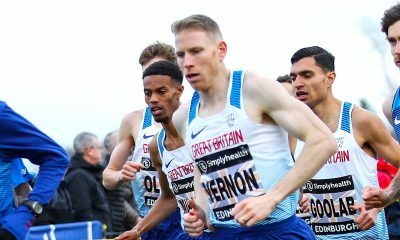 The English Cross Country Relays on Saturday (November 4) will see more than 1000 teams compete across 10 races, while on Sunday defending champions Jonny Mellor and Eilish McColgan lead the entries for the Leeds Abbey Dash. 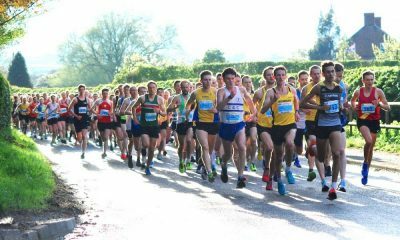 Elsewhere this weekend, the popular Cheshire 10K returns for its second edition this year. Berry Hill Park in Mansfield will stage its 28th English Cross Country Relays on Saturday. Over 1000 teams are entered with 205 Senior Men’s teams and 145 in the Senior Women’s category – record-breaking numbers. The relays always provide high-end racing and among those hoping for top honours are last year’s men’s winners, Aldershot Farnham and District. The silver and bronze medallist from last year Tonbridge AC and Bristol & West AC will also be strong contenders for podium spots again. Aldershot Farnham & District have been dominant in recent years over the Women’s 3-stage relay. 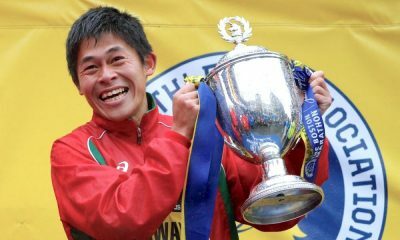 Having recently triumphed at the National 4 stage Road Relays and with such impressive depth, and even with some top athletes away attitude training, they look favourites to retain their title. The main challenge should come from Leeds City, Charnwood and Rotherham AC. The English Cross country Association has advised all athletes to review the new timetable as changes have been made this year to the running order and start times. 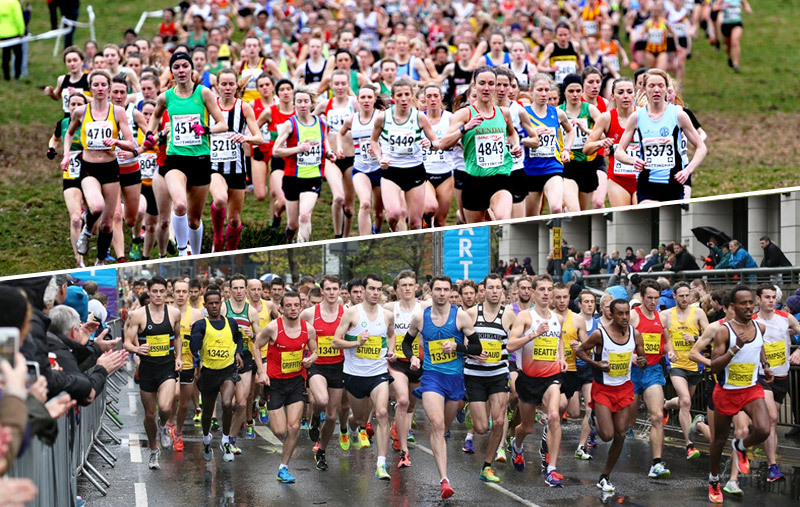 Returning for the 32nd year this weekend is the popular Leeds Abbey Dash 10km. The race is renowned for very fast times and last year saw a close battle between Jonny Mellor of Liverpool Harriers and Southend’s Adam Hickey for the win. By the line, the pair were separated by three seconds in times of 29:12 and 29:15 respectively. In 2016 fourteen men dipped under the 30-minute barrier and a staggering 32 men under 31 minutes. The women’s race also attracts a high pedigree and in 2016 Olympian, Eilish McColgan won in a time of 32:52 beating Gemma Steel of Charnwood in the closing stages. Like the men, it was a battle right up until the line and again only a three-second margin. Jonny Mellor is entered for the race on Sunday and will be hoping for a consecutive Dash title. The Liverpool Harrier comes into the race in great form after a superb run in the Berlin marathon last month which saw him run 2:12:57. Having been left out of the English Commonwealth Games team, Mellor will also have the added motivation of proving the selectors wrong. Though Mellor will not have it his own way and could be challenged by training partner Ben Connor of Derby AC. Connor recently had a great battle with Chris Thompson at the Great South Run, just losing momentum in the final stages before finishing in third. Other entrants to watch out for include; Adam Hickey (Southend), Andrew Davies (Stockport Harriers), Emile Carriss (Leeds City), Josh Grace (Aldershot Farnham & District), and Kevin Seaward of Cardiff AC. Eilish McColgan leads the entries in women’s field and will hope for a consecutive title at the Leeds Abbey Dash. 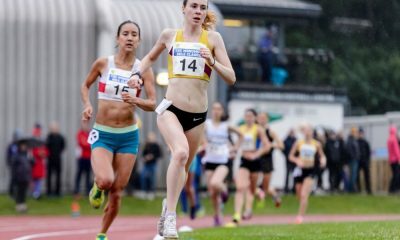 The Dundee Hawkhill runner, who finished 10th in the 5000m at the World Championships, has enjoyed an amazing few months of PB’s including 14:48 and 8:31 for 5000m and 3000m respectively. Other strong entries include triathlete Emma Pallant and Rebecca Robinson of Kendal AC. Some quick times have been recorded on this course around the grounds and nearby roads of Arley Hall in Cheshire. The course hosts two 10km events per year and in this second edition of 2017, we can expect to see Moh Abu-Razeq of Altrincham AC on the start line as well as Matt Clowes (Cardiff AC). Both athletes have run this course previously and have posted fast times. The race awards £20 for the quickest athlete through each of the km markers between 1km and 9km and £100 cash for the win, providing an incentive that can lead to some exciting and more aggressive race tactics than often seen on the domestic circuit. In the Spring edition earlier this year, Moh started quickly through the first 3km but Clowes tracked him back and stormed to the win in 29.29. Abu-Razeq will be looking to turn the tables on the Cardiff athlete this weekend and improve on his 30.26 time from March. The same incentive scheme is in place for the women and March saw Hannah Griffiths of Stockport capitalise with a win in 35.56. A regular in Northern road races Kirsty Longley (Liverpool Pembroke Sefton), finished runner-up and is a previous winner over the course so could be likely to return once again to try and regain her title. The female course record holder is Helen Clitheroe (Preston Harriers) who clocked 32.44 in 2014, highlighting the potential for very quick times over this course, if conditions are favourable.